Florida is home to some of the rarest species of underwater flora and fauna around the Continental United States of America. Apart from that, it is also home to the highly diverse and complex “Florida Everglades” ecosystem. Such a diverse ecosystem obviously opens the door for unique flora and fauna businesses for sale in Florida. The vast everglades swamps have been attracting marine life explorers and enthusiasts for generations and as the concept of eco-tourism has grown, so has the popularity of the state’s beaches and reefs. As a matter of fact, Florida has a lot to offer people who have always been interested in the underwater world and have been keen to acquire a SCUBA (self-contained underwater breathing apparatus) certification. This is because the never-ending coast line (the state of Florida is a actually a peninsula jutting out from the American mainland and is surrounded on three sides by vast expanses of sea water) offers experiences full of unparalleled adventure as well as a truly unique opportunity to see the world as it exists, right beneath the waves. This way a new scuba diver would be a able to’ get up close and personal’ with the denizens of the deep, in their own habitat. Setting up a scuba diving school or even a snorkeling outfit to be able to help people enjoy the warm waters of southern Florida is a truly great business idea. 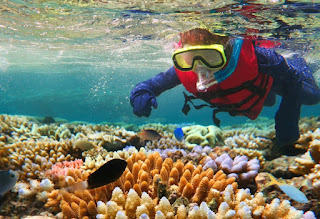 And for beginners, you can even come up with snorkeling expeditions that do not require either the training or the heavy backpacks of a fully self-contained scuba suit. You can start the prospective tourists off with basic snorkeling and then ‘graduate’ to a fortnight long “SCUBA certification and environmental exploration program”. It is one of the most popular programs of the global PADI (Professional Association of Diving Instructors) organization. In fact, you can then take your clients directly to the most popular snorkeling and scuba spots on the southern Florida coastline where they can make their presence felt by helping rescue Sea Turtles, rescuing marine life caught in nets or even get to work cleaning underwater rubbish and debris. Apart from the underwater world, you can also take your clients and customers to boat safaris in the everglades where they will be able to observe alligators and other exotic marine life from the safety and security of fast moving boats and be able to see the awesome ecosystem and the different species that exist there. Or you can take them to trips to the Fort Lauderdale area where they can both enjoy the beach while shopping to their heart’s content near the promenade. Mother nature has made the state of Florida an ideal playing ground for people who love water sports; both above and under the waves. Florida is definitely one of the top destination spots if you are seeking a flora and fauna businesses for sale.